I love when weeks just zoom by. I really feel like this week is so much shorter than most and it is hugely appreciated. Last night, we celebrated my amazing friend Tarryl's birthday (from True Worth Design) and it is always such a nice treat whenever I get to see her. Also, I got the best news because I think she's moving back to Vancouver! Can't get much better than that. The colour of your jeans is very beautiful and I love your blazer and your bag. gorgeous, those booties are hot! love your blazer, it fantastic!!!! the boots are amazing. must have! very nice outfit! the colour of pants is my must have! OMMGGGG!!! I love your outfit!!!!! I am following you and hope you'll follow me back beautiful!!! que guapisimaa!!! me encantan los botines, son precioso! Allison, this look is so nice. I love the jeans :) adn the scarf and the whole thing you did with the outfit. very nice. Congrats on your friend moving back to Vancouver! I can definitely relate to the excitement as I've had close friends movie away. I've also been obsessed with statement shoes/boots. If I'm too lazy to coordinate an outfit or layer over a statement piece of clothing, putting plainer clothes with statement shoes just makes it easier. Have a happy almost weekend! Gorgeous outfit! Love your pants and blazer! 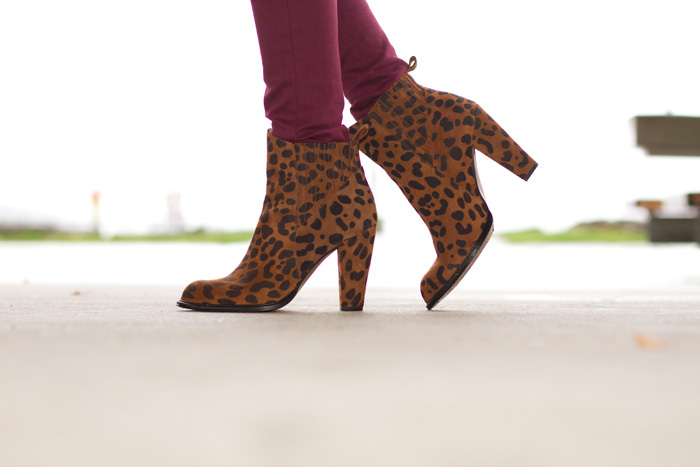 Love the burgundy & leopard combo! Those shoes are great! I'm really enjoying your blog Alison and another great one today. Loving your shoes and look forward to seeing them some more. Such a great outfit! So fun, but still easy and comfortable. The shoes are amazing. Like the darker shade, too. The peek-a-boo print under your blazer is a neat touch. Is it the lining? Loving this combo! The leopard touches are perfection. Super pretty look! 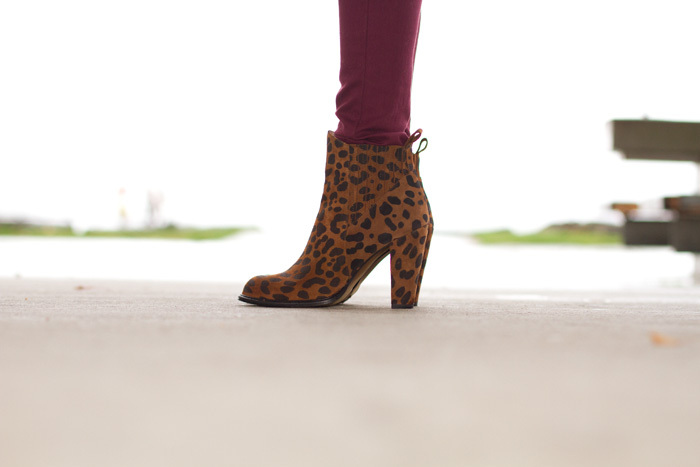 I love those cute leopard booties they look amazing with your burgundy pants! How awesome that your friend will be moving closer to you, exciting! Love the jeans and the boots! Such a great look! You look very stylish! I love leopard print shoes! I love your sophisticated chic look! I like the small hints of leopard. Very classy. Love your bag! You've got a great style!